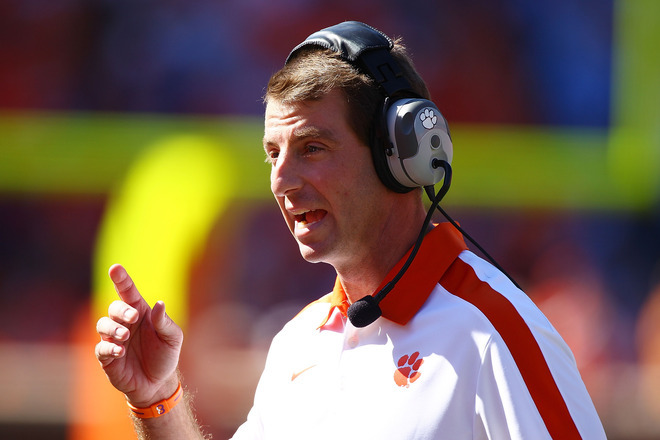 Clemson coach Dabo Swinney isn't paying much attention to the lofty rankings. Clemson's opponents had better be prepared to play the full 60 minutes. Tigers focused on Georgia Tech, not the rankings. Clemson might not be a one-year wonder with Sammy Watkins. Injuries continue to be an issue for Virgina Tech's defense. Boston College trying to focus on the positive during tough times. Wake Forest continues to find ways to beat Duke. Maryland struggles against Florida State, leaving question marks at quarterback. Florida State is starting to build some momentum. Miami defense is starting to come around. Recapping Clemson's win over North Carolina. A preview of the upcoming game between Florida State and NC State.